Antiparos is a small charming island famous for its relaxed and authentic atmosphere, characteristic Cycladic architecture with cobbled streets and whitewashed houses, and it is located in the heart of the Cyclades complex only one nautical mile southwest of Paros. It has gained worldwide reputation due to its secluded golden sandy beaches, picturesque settlements, good shopping markets, imposing Venetian Castle, the archaeological excavations at Despotiko islet, coastline sea caves as well as the famous, 100 meters deep Cave of Agios Yiannis filled with impressive stalactites and stalagmites. In the recent years, it has evolved into a cosmopolitan venue, with great entertainment options and interesting attractions. Antiparos manages to beautifully combine a tranquil lifestyle with a lively vibe and attracts a lot of yachts to its secluded beaches. Whether you decide to visit Antiparos for holidays or as a day trip from Paros, this island is a great option for those who enjoy jet setter scene and lively atmosphere. The Venetian Castle: Antiparos’ Venetian castle is situated close to the main square of Chora and is one of the few preserved castles that are currently inhabited. It is not a simple fortification work but a well organized group of buildings and houses and remains one of the most interesting medieval settlements in the Aegean. It was constructed in 1440 for the protection of the island's inhabitants from pirate raids. 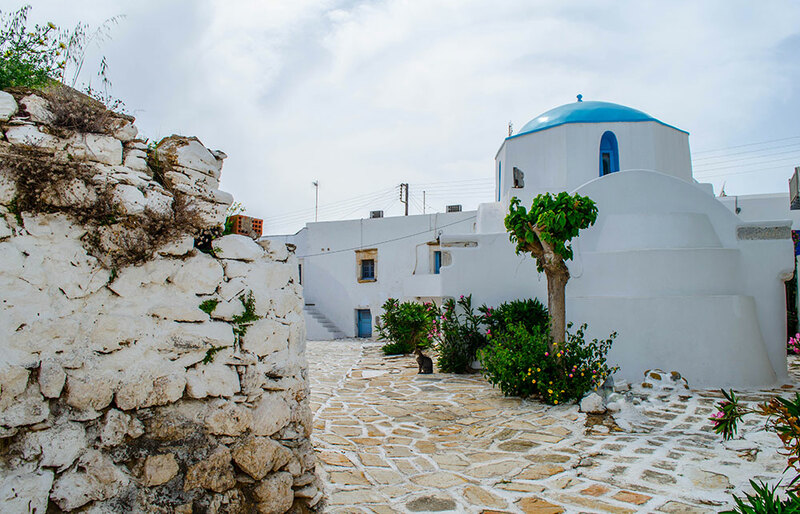 As you walk through the castle you can feel time’s breath, since people have lived here for almost 500 years, and admire the Cycladic architecture. Agios Yiannis Cave: Just 8 km from Chora, in the edges of the mountain Ai Yiannis, is the known Cave of Antiparos, one of the most beautiful and mysterious caves in the world. The cave was used as a refuge during the Neolithic period and later on became a cult place of Goddess Artemis. The “Katafygi” as locals used to call the cave is located 171 meters above sea level, it covers an area of 5.600 s.m. and its maximum depth reaches 100 meters. In the caves outdoor area two small churches were built, Ai Yannis (as the cave is called now) and Zoodohos Pigi. The inscriptions and engravings in the interior of the cave evince prominent visitors, such as the Alexander the Great, King Otto, the French botanist Coronelli, the Venetian cartographer Martin Laeke, Conte De Gobina, Elen De Tasec, Bishop De Gambrie and Lord Byron. The cave has exceptional visibility allowing visitors to clearly observe its breathtaking interior with great detail. 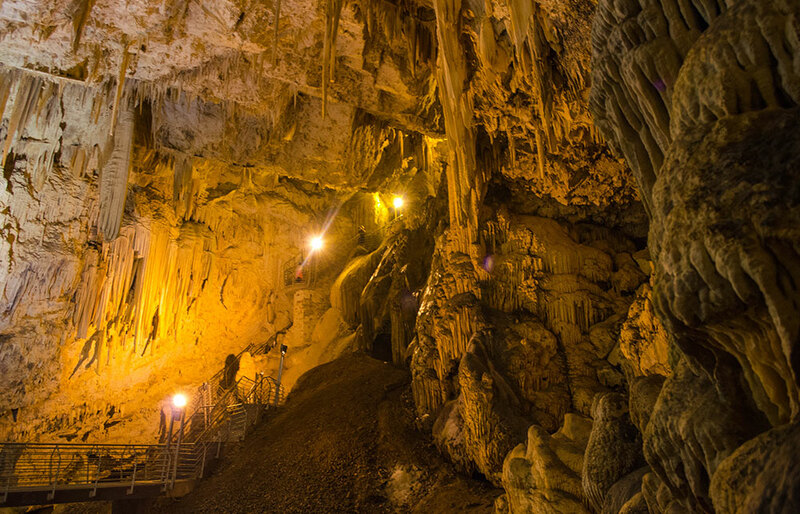 Dating as far as 45million years back its exquisite stalactites and stalagmites are among the oldest in Europe and the cave is considered a natural museum. Nowadays, the cave is fully exploited with steps, lighting, security cameras and loudspeakers to inform visitors. 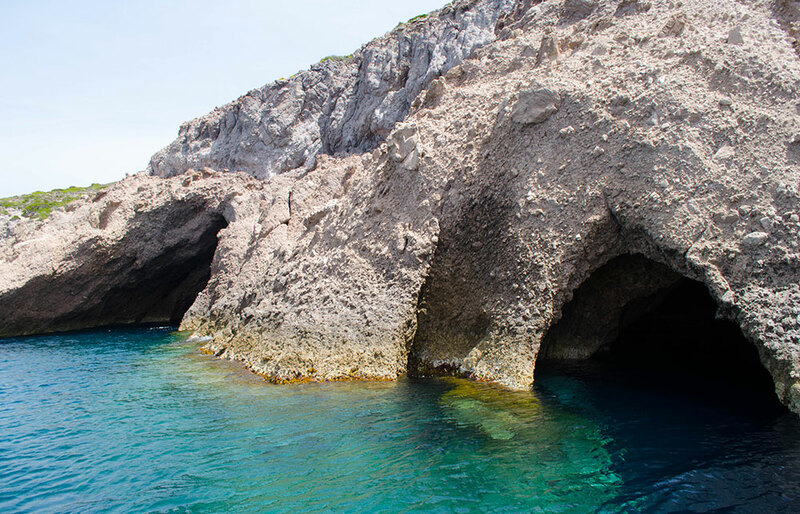 Sea Caves: Antiparos is filled with a many enchanting sea caves worth exploring. Its vertical cliffs and emerald waters present the most enjoyable swimming experience. 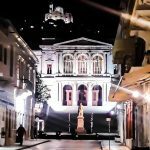 Historical & Folklore Museum: In Chora you will find the Historical & Folklore Museum of Antiparos, with significant references to Aegean Culture, such as ancient coins, authentic engravings from the cave of Antiparos and one of the most significant libraries of Cyclades. 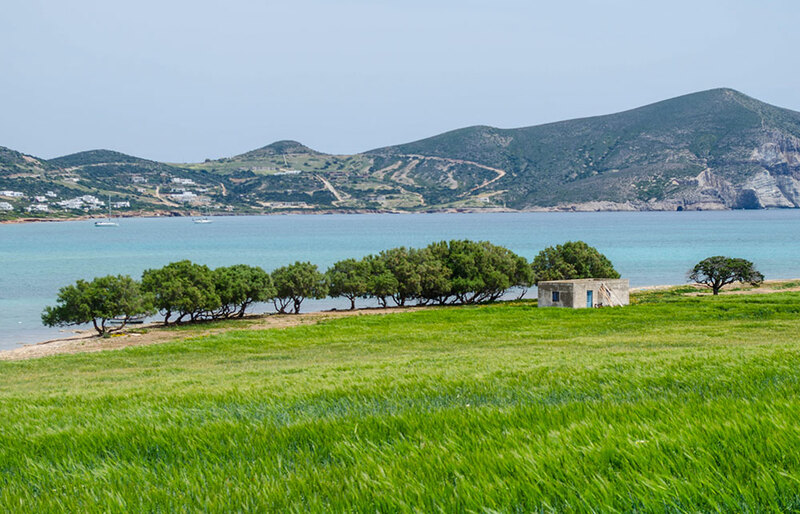 Archeological Sites of Despotiko & Neighboring Islets: Southwest of Antiparos right across Agios Georgios village is the small islet of Despotiko, which has great historical interest. Currently the islet is uninhabited and major excavations are conducted. Important findings include: two cemeteries from the primary Cycladic era, remains of pre-historic settlements, parts of a Dorian temple, a temple dedicated to Apollo and a big idol of a female goddess named Isthmia, verifying the existence of an Isthmos (connecting canal). Excavations will continue so as to turn Despotiko islet into an archeological park. 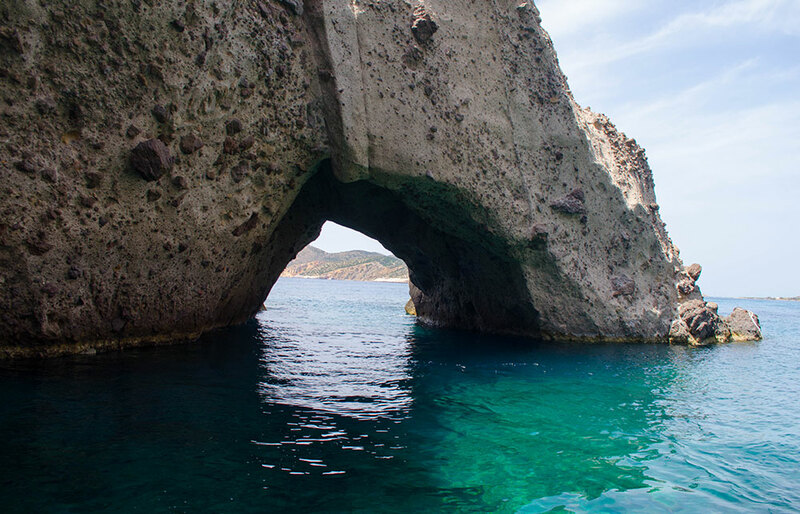 Close to Despotiko are the islets Tsimintiri and Strogilo that are also of great archaeological interest. Chora is the main village and port of Antiparos. The settlement spreads around the imposing Venetian Castle of Antiparos offering a unique view. 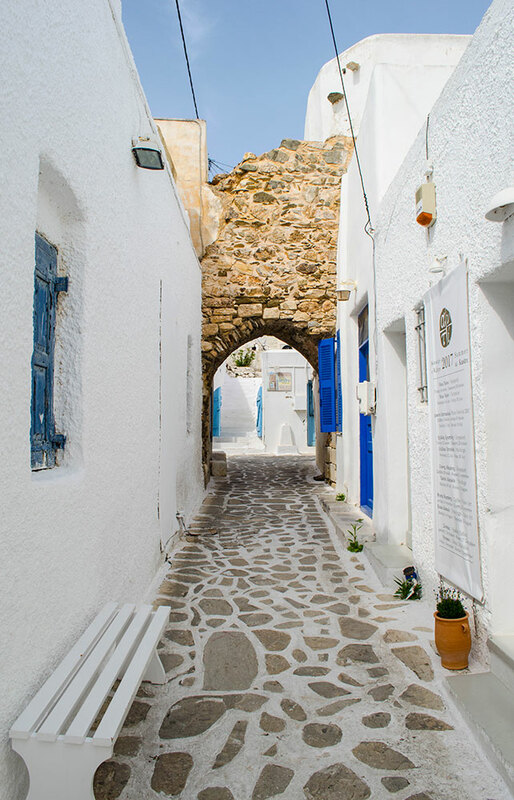 This small picturesque Cycladic village with whitewashed pavements and flower filled houses is also the most inhabited settlement. The most vibrant spot of Antiparos is Chora’s central square, filled with cafes, bars, clubs, shops, taverns and restaurants. It is a good location, serving as a base to get to know the island. On the southern part of the island, 12 km from Chora, there is the small but well known settlement of Agios Georgios, which is inhabited only during the summer season. Its beach is ideal for swimming, sunbathing, and having some fresh fish in its nice taverns while overlooking the beautiful view of the rocky islet of Despotiko. 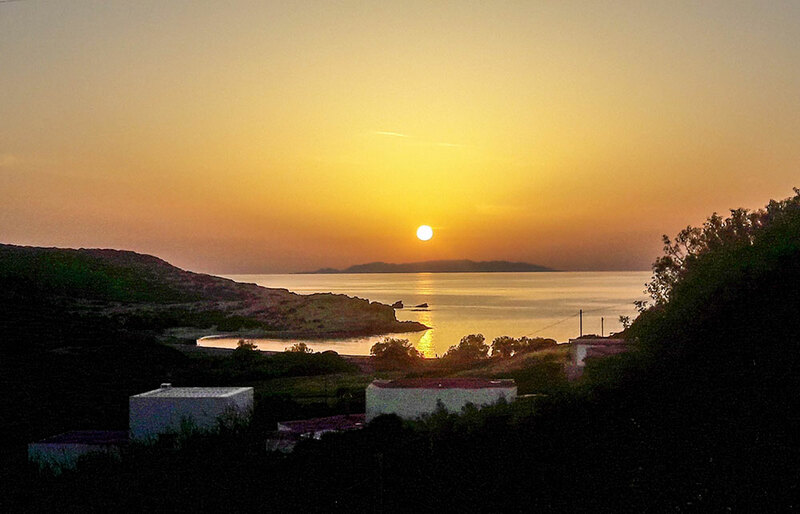 On the west coast of Antiparos, 8km from Chora, there is the charming little settlement of Soros with a beautiful sandy beach, a lot of accommodations and a traditional tavern. Soros is the ideal for relaxation. 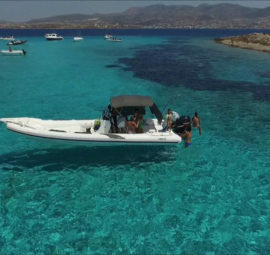 Antiparos is surrounded by diversified beaches. On the one side you will find calm waters and golden beaches and on the other sheer rocks with caves sculptured by the open sea and winds. Scuba diving, windsurfing, kite surfing, kayaking, paddling etc, are only few of the activities offered on the island. The island's morphology invites you to explore places of unique beauty. Agios Georgios Beach: is the beach of Agios Georgios village. This picturesque bay with blue waters offers a panoramic view to the islet of Despotiko. The beach is unorganized but you will find many tavernas near to get a break from the sun. Camping Beach: is probably the most popular one on the island and nudism friendly. As its name reveals, right next to the beach there is the only Camping site of Antiparos. It is a long sandy beach about 100m on foot from Chora. Its azure waters along with the surrounding greenery create a very relaxing environment. The camping provides tents for those looking for a break from the sun as well as large spaces to camp overnight in this tranquil landscape. Epitafios Beach: is a hidden white beach with amazing emerald waters behind one of the sea caves in the area of Agios Georgios. The beach is surrounded by tall vertical cliffs and is waiting for you to discover its morphological interest. Swimming here is a unique experience, but you can only come here by boat. Glifa Beach: is on the southern area of Antiparos 6 km from Chora. It is a tranquil beach with golden sand and crystal blue waters. Its location gives it an unspoiled look and a nice view towards the island of Paros. Close by you will find few tavernas and hotels. 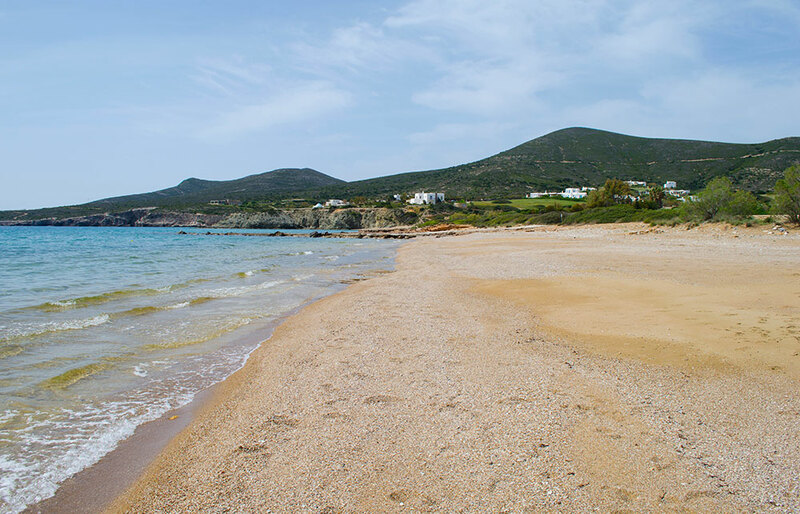 Livadi Beach: is located on the western side of Antiparos about 17km from Chora. The beach is not easily accessible due to the rough hilly roads of the island. It is a beautiful, serene beach, with crystalline blue waters relatively exposed to the winds. It is worth visiting when the winds settle due to its lovely scenery. You will probably have the beach to yourself and enjoy a beautiful sunset away from the crowds. Panagia Beach: is located 1 km to the south of Chora, right after the main beaches of Psaraliki. Panagia is one of the most picturesque beaches on Antiparos. It has blue waters, fine golden sand, natural shade from the trees and serene atmosphere. Nearby there is a well known Greek tavern with traditional treats. The beach is ideal for relaxation. Psaraliki Beach: is comprised of two beaches, Psaraliki I and Psaraliki II. They are both lively sandy beaches with shallow waters and a lot of water sport activities and amenities for swimmers. Nearby there are traditional taverns and music clubs, which are open until early in the morning. Both beaches are very easily accessible. Sifneiko Beach: is very close to Chora on the west side of the island. It is named after Sifnos island, which is facing it and can be seen from the shore on clear days. This beautiful beach can get a little windy during the summers moths, but offers the best sunset view on the island. Its crystalline waters are ideal for snorkeling and on its golden sand one can relax and enjoy the tranquil surroundings. Soros Beach: is a popular beach located on the southern side of Antiparos, with cerulean waters, long sand and trees offering natural shade. Soros deep waters with few rocks near the sore are not suggested for families. There are two taverns nearby offering fresh fishes and local delicacies. Southwest of Soros you will find small bays where you can enjoy some privacy. Vathis Volos: is located near the village of Agios Georgios about 12km southwest from Chora. This is a lovely sandy beach with crystal green waters offering privacy and relaxation. The beach is right opposite to the uninhabited Despotiko islet, with the amazing beaches, and usually boats tours to Despotiko make a stopover in Vathis Volos as well. It has few taverns and some hotels nearby ideal for relaxation. In antiquity Antiparos was known as Oliaros. 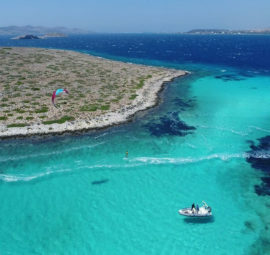 Τhe first reference to Antiparos under its present name is found in the 13thcentury. According to the Greek mythology Antiparos was one of the 50 sons of Egyptos who was murdered along with 48 of his siblings by his wife Kritomethea, one of the fifty Danaides. Ancient Years: Antiparos was inhabited first from Sidona and later by the Minoan Cretans (2nd Millennium B.C.) and many other followed. 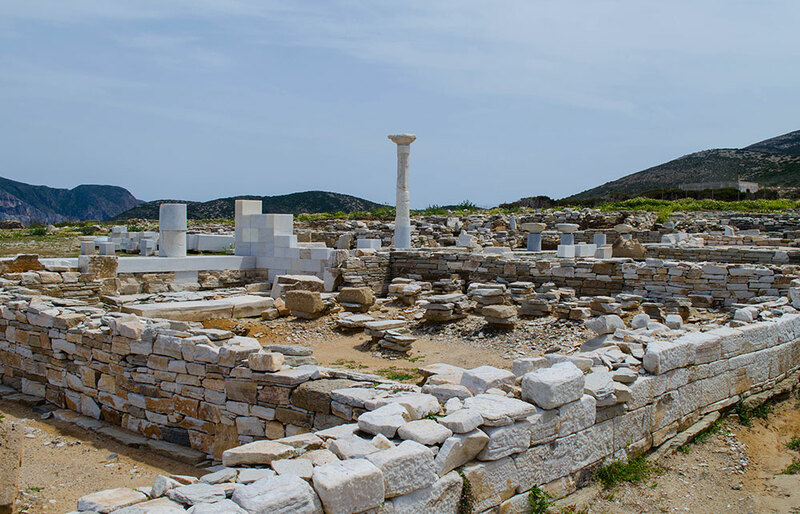 13th century AC: Antiparos was seized by the Venetian nobleman Marco Sanoudo, and it remained under his occupation up until the second half of the 14th century where it passed to Sommaripa after the wedding of Maria Sanoudos to Gasparis Sommaripa. 15th century AC: In 1440 Antiparos was given to the Venetian family Lorentano (as dowry for the wedding of Leonardo Lorentano to Frantseska Sommaripa) which build the Antiparos castle. In 1480 it passed to the Venetian family of the Pisani. 16th century AC: 18th century: In 1537 Antiparos and the rest of the Cyclades fell to the Ottomans and remained under Ottoman rule until the Greek war of independence in 1821, apart from a small period from 1770 to 1774 when it was under the Russian rule. That period many of the precious stalactites from Antiparos Cave were removed to the Hermitage Museum in Russia. 19th century AC: In 1832 Antiparos officially becomes part of the Greek State. 20th century AC: Antiparos was put into the touristic spotlight in 1960 when the hit Greek movie “Madelena” was filmed in the island. Since then the island became a popular travel destination both for Greeks and foreign tourists. 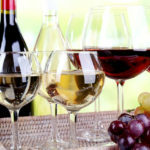 Paros Wine: don’t forget to try some local wine from the neighboring island of Paros. Paros is the second wine-producing island of the Cyclades after Santorini and has remarkable vineyards. A lot of reds, roses and white wines are produced on the island. 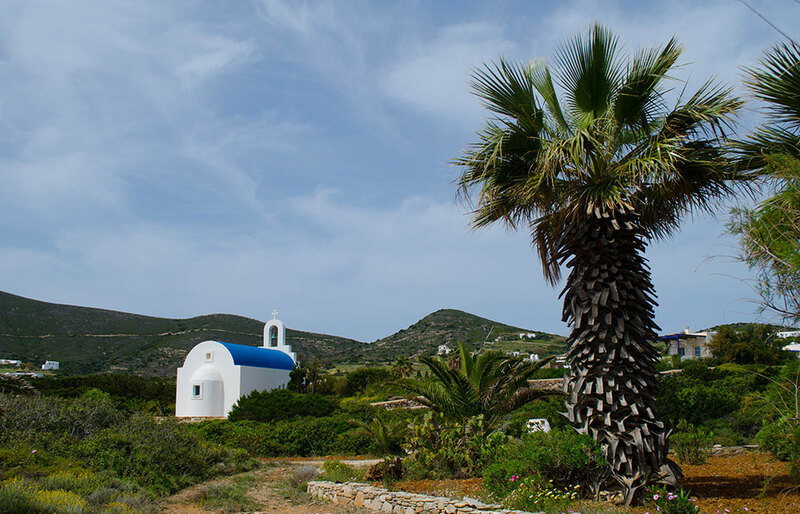 Antiparos has some very interesting religious and cultural feasts that honor the island’s rich traditions and give its visitors the opportunity to meet Antiparos unique customs. 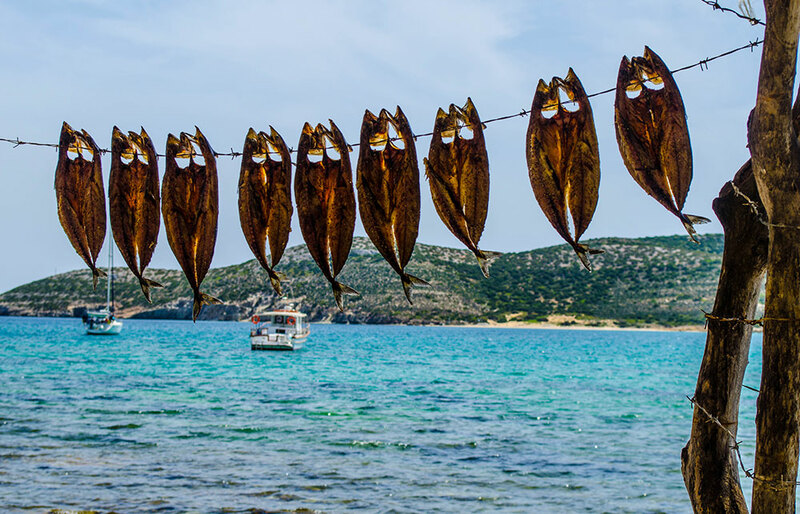 Agia Marina Festival: On July 15-17 the 3 day festival of Agia Marina, the patron saint of Antiparos, is celebrated in the island, with a lot of cultural events and athletic competitions, as well as award nominations, celebrations, dancing, singing and feasting. 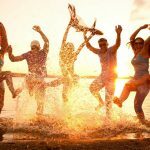 Agios Ioannis Spiliotis Festival: On May 7th& 8this one of the best-known festivals in the island of Antiparos right at the entrance of the momentous cave of Antiparos, with a lot of dancing, wine and traditional treats offered to all visitors. Agios Panteleimon Festival: On July 27th Agios Panteleimon is celebrated in the area of Kampos, with dancing, singing and traditional treats. 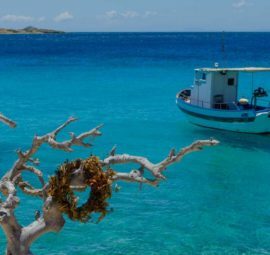 Ai Prodromos Klidonas Festival: On June 24th &25th the festival of Ai Prodromos is held in Antiparos.“Klidonas” is an old custom associated with a popular fortune telling process, which is said to reveal to unmarried girls the identity of their future husband. The girls gather in front of a traditional pot and hide inside personal objects. According to tradition, the same night on their dreams the name of their future husband is revealed to them. Meanwhile, the night before, a big fire is being set in the middle of the main square and the whole village jumps over it as an act of symbolic catharsis from evil. Panagia Faneromeni Festival: On September 7th the celebration of Panagia Faneromeni is being held in the southern part of Antiparos. It is reached by sea - on fishing vessels - or by road. Antiparos Cinema Days: During July, Antriparos holds cinema workshops for high school students and free screenings for all in the open air cinema of the island, Cine Oliaros. 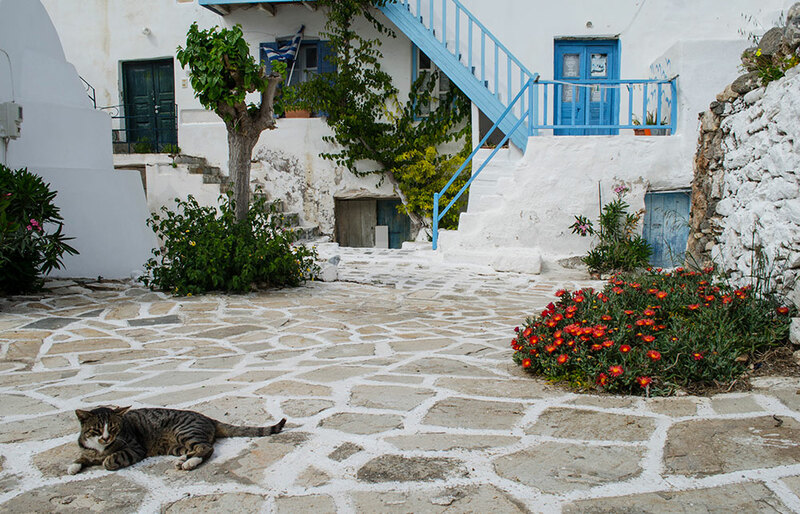 Antiparos International Photo Festival: an annual photography festival held in the month of July.